� and addresses this concern! Click here for the 7-Liter Vented Induction Chamber Independent Test Data. Constant exhaust over the opening of these chambers assure investigator safety. * Excess anesthetic vapor is completely captured during all phases of the induction process, even while removing the animal. 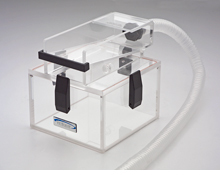 Connect to nonrecirculating exhaust, or pair with one of our evacuation units for the latest in anesthesia safety. Available in the standard 2-Liter size and introducing our new 7-Liter model for larger animals or groups of animals. Convenient slide top lid and standard inlet and outlet fittings. 6ft of 30mm evacuation tubing included.